This is a high-level summary of our key findings from the June 2014 Small Business Pulse Survey. This survey concentrated on Leadership Qualities of Business Owners. The survey was taken by 336 business owners. Most of the survey participants are in established businesses. In fact, 55% have been in business for more than 20 years. In terms of size, 26% of the prospects have annual revenue of $5 million or more. An additional 43% have revenue between $1 million and $5 million. The most common employee size by the survey participants was 10-49 employees with 40% of participants in this range. The most common industry sectors are Professional Services, Manufacturing and Construction businesses. It’s important that the leader establishes and communicates a vision. But it’s even more important that they accomplish goals. One without the other has little value. Leaders prefer to look to the upside–opportunities–rather than dwell on the downside – the risks. Leaders are also more risk-willing than risk-adverse. They will take calculated risks to achieve what they feel is a significant opportunity. In working with their employees, it is important that the leaders inspire action in their staff. Leaders also prefer that their employees respect them, rather than be liked or feared. Leaders seek input from others to make better decisions and overcome obstacles. • 46% of participants identified Accomplishing Goals as most important. 38% of participants identified Setting a Vision. Only 9% selected Establish Rules and Structure and 7% selected Setting an Example. Do Business Owners Primarily Pursue Opportunities or Manage Risk? Overwhelmingly they pursue opportunities. 90% of respondents selected Pursue Opportunity to serving the goals of the business while only 10% selected Manage Risk. Respondents also identified themselves as more willing to take risks rather than be risk adverse. On a scale of 1 to 10, with 10 being “the most risk-taking person,” 74% of respondents labeled themselves a 6 or higher. The outcomes of decisions were not always great when respondents took significant risk. When asked to characterize the outcome of business decisions when they took significant risk, only 13% rated the outcomes as Excellent. However, 69% rated the outcome as good and only 1% as poor. • 63% of owners felt their role was to Inspire Action. Interestingly, while 58% of those that selected Accomplishing Goals as their primary responsibility selected Inspire Action, 75% of those that selected Provide a Vision selected Inspire Action as their primary objective with employees. Providing a Vision and Inspiring Action are seen as critically important by business owners. How Well do Leaders Communicate with Employees? Having a good vision and goals is one thing. The vision and goals will only be achieved if employees are aware of them and understand their role in accomplishing the vision and achieving the goals. In our survey, 72% of participants selected 7 or greater (on a scale of 1 to 10) when asked how well their employees understand their role in achieving their vision. However, only 12% selected a 9 or 10. There is room for improvement. How Do Leaders Want to be Perceived by Their Staff? The respondents on the survey were not Machiavellian. In fact, zero respondents wanted their employees to fear them. They don’t necessarily want to be liked either. Only 3% preferred that their employees like them. Instead, 32% of owners want to be understood by their employees. Most importantly, 65% preferred that their employees respect them. How Well Have Business Owners Prepared for a Leadership Void? Not well enough. We asked multiple questions about the leadership skills of the best available employee or executive in the company. We asked about how effective the employee or executive would be if they needed to step in and run the business for three months and for one year. For all questions asked about the effectiveness, 50% or more labeled this person Somewhat Effective. The next most common response was Very Effective. Our observation is that business owners should better prepare a second in command to be able to run the business effectively in their absence. 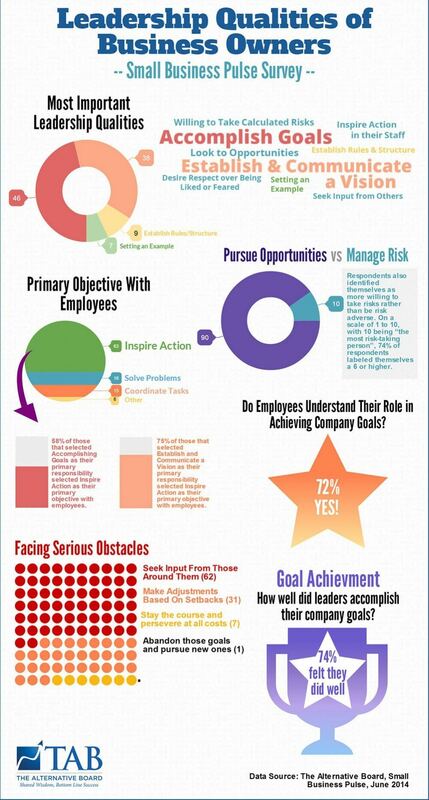 Those that identified Accomplishing Goals as their primary leadership task, achieved an 8 or higher 45% of the time. Those that identified Providing a Vision as their primary leadership task achieved an 8 or higher 50% of the time. Leaders are committed to achieving their goals. When asked how they respond when faced with serious obstacles, only 1% of respondents said they abandon their goals and pursue new ones. The majority of respondents do not attempt to go it alone either. When they do face obstacles, 62% seek input from thosearound them. concentrated on Leadership Qualities of Business Owners. The survey was taken by 336 business owners. Services, Manufacturing and Construction businesses. they accomplish goals. One without the other has little value. Leaders prefer to look to the upside–opportunities–rather than dwell on the downside – the risks. feel is a significant opportunity. Do Business Owners Primarily Pursue Opportunities or Manage Risk? person,” 74% of respondents labeled themselves a 6 or higher. Excellent. However, 69% rated the outcome as good and only 1% as poor. Provide a Vision selected Inspire Action as their primary objective with employees. role in achieving their vision. However, only 12% selected a 9 or 10. There is room for improvement. fear them. They don’t necessarily want to be liked either. Only 3% preferred that their employees like them. How Well Have Business Owners Prepared for a Leadership Void? respondents do not attempt to go it alone either. When they do face obstacles, 62% seek input from thosearound them.